A sprinkler system at St. Mary’s Cathedral has been drenching people who seek shelter there for two years, but after that action became highly publicized the bishop backtracked saying the church's aim was never to douse people. 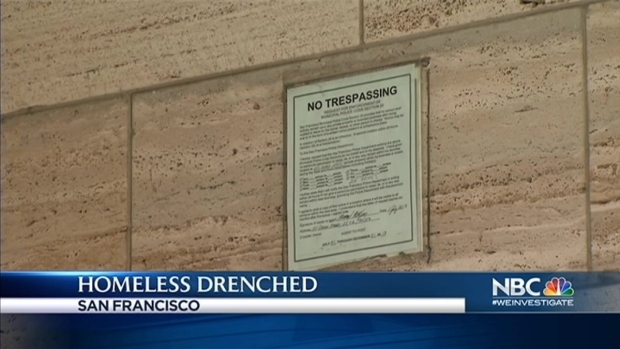 At a news conference Wednesday, Archdiocese of San Francisco Bishop William Justice promised the sprinklers were already being removed at the iconic church on Gough Street, which turned on at least once every hour, spraying those who slept there. The bishop noted the Cathedral is a hub for "hundreds of homeless people," and opens its doors to help those in need "more than any other Catholic church." The sprinkler system was installed two years ago, after church officials learned that this was a popular method in the city's financial district, according to a statement provided by spokesman Larry Kramer. The system was installed as a "safety, security and cleanliness measure to avoid the situation where needles, feces and other dangerous items were regularly being left in these hidden doorways," the church statement reads. The bishop said he was worried about students and elderly people passing by the church in these conditions. The bishop said that those who regularly slept in the doorways of the church were told in advance about the sprinklers. And the "idea was not to remove those persons, but to encourage them to relocate to other areas of the Cathedral, which are protected and safer," the church statement read. A sprinkler system at St. Mary’s Cathedral has been drenching people who seek shelter there for two years, but after that action became highly publicized the bishop backtracked saying the church's aim was never to douse people. Jodi Hernandez reports. Still, the church conceded that leaders now realized the system needed a permit and "may violate San Francisco water-use laws," and work to remove the system has already started. "We are sorry that our intentions have been misunderstood and recognize that the method used was ill-conceived," the statement read. "It actually has had the opposite effect from what it was intended to do, and for this we are sorry." The church made its announcement only after KCBS radio’s Doug Sovern first reported the story, alleging that the church installed the watering system to keep the homeless from sleeping in the Cathedral’s doorways. And before the announcement, homeless people and advocates were none too happy. “It’s unbelievable,” said Joshua Pittman, a homeless man, said early Wednesday morning. “Because a church welcomes all with open arms. Because it’s funded through God." The Coalition on Homelessness in San Francisco called this “cruel,” if true. Staff members say they know the city of San Francisco and Department of Public Works will sometimes spray people sleeping on public sidewalks, but that pouring water directly on people is “one of the meaner things” they’ve heard. A sprinkler system at the church on Gough Street has ended up spraying those seeking shelter there. Stephanie Chuang reports. Coalition members say the best thing that people actually never try first is speaking directly with homeless people. The church on Wednesday also got a permit to remove the sprinklers.